How Much Does Vacant Condo Staging Cost in Calgary? 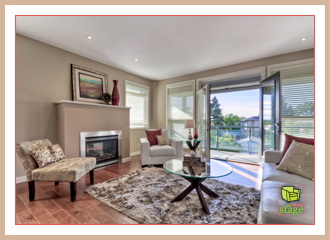 The cost of professional home staging in Calgary is a common topic of interest. My answer? It depends. In terms of vacant condo staging, the costs can quickly add up. But because potential buyers don’t respond as positively to an empty space, your investment in staging to highlight its features is well worth it. Here’s an example of a vacant condo that I staged in Calgary. To give this main living space a wow factor, it needed furniture, accessories, artwork, and lighting. Just the inventory alone in this open concept living room added up to $2,256 (if you were going to purchase the stock yourself). Then add the time for shopping and staging (approximately five hours – how much is your hourly rate?). Plus there are fees for delivery and removal (anywhere from $75-150/hour). So, depending on the size of your condo, you can see how a $5,000 budget for staging would go quite quickly if you decided to purchase everything and stage it on your own. Luckily, when you hire a professional home stager, is it much less because the inventory rentals are a fraction of the actual costs. You also save yourself the time and stress (of will this look good?). The home staging investment for this room was less than $650. perfect space for entertaining or relaxing. 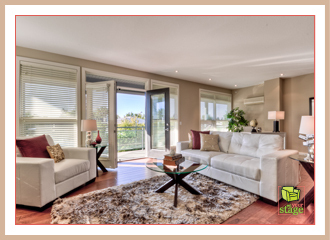 Staging a vacant condo is an investment. I’ve written about it before in the blog posts, Does Home Staging Really Work? and Staging Cost is an Investment. In a sense, it’s about spending money to make money. The return on your investment makes staging a low risk expense. 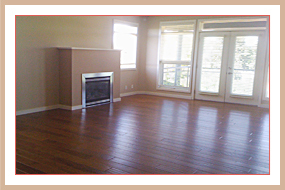 Find more about Set Your Stage’s vacant condo staging service here. Did you know that only 61% of listed homes in Calgary sold in 2012? Set Your Stage properties sold over two times faster on average than the homes that did sell in the same areas. To find out how your property could benefit from vacant condo staging, contact Jen today for your personalized Home Staging Assessment. This entry was posted on Monday, September 30th, 2013 at 3:07 PM	and is filed under Home Staging FAQ. You can follow any responses to this entry through the RSS 2.0 feed. You can leave a response, or trackback from your own site. Thanks for these tips! I want my condo to look great for people to see. I am now looking up some experts to help me arrange it.